The African Union (AU) has made a decision on whether to admit and determine the case between Zambia and Barotseland before its Commission on Human and Peoples’ Rights. The Zambian government has been blocking the AU from hearing the case. In its letter addressed to Barotse National Freedom Alliance (BNFA) Chairman General Clement Wainyaei Sinyinda dated 18th August 2015, the Commission Secretary Dr Mary Maboroko said the decision of the Commission will be transmitted to Barotseland after the Assembly of Heads of State and Government of AU authorizes publication of the Commission’s report. 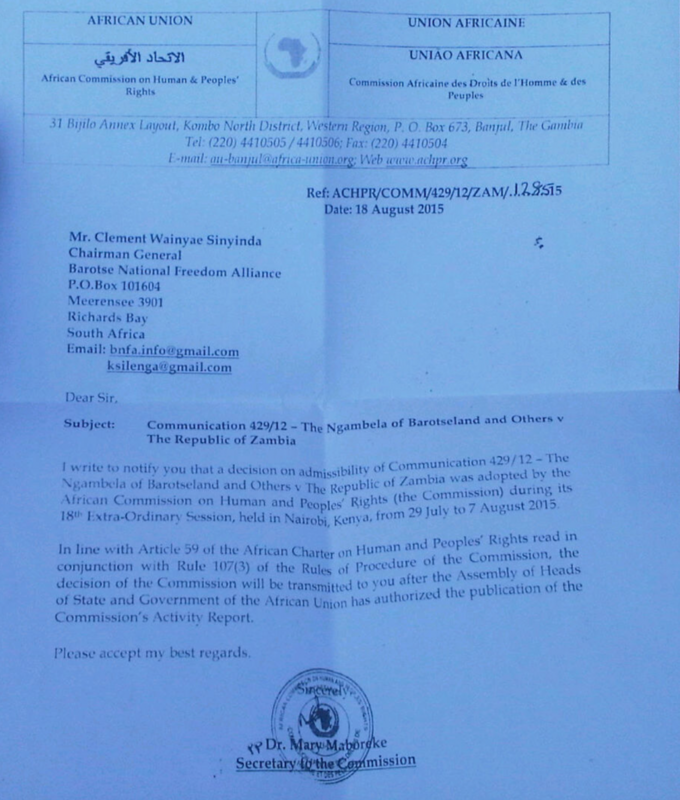 ‘ I write to notify you that a decision on admissibility of communication 429/12-The Ngambela of Barotseland and others versus the Republic of Zambia was adopted by the African Commission on Human and People’s Rights during its 18th extra ordinary session,’ reads part of the letter obtained by the Zambian Watchdog. The Zambian government had recently submitted through Solicitor -General Abraham Mwansa to the Commission to throw out Barotseland ‘s submissions on admissibility of the case. As the case advances, there are possibilities that people who engineered human rights abuses against the people of Barotseland will be held to account for their actions. The killing of Barotse activists of 14th January 2011 was under the watch of former President Rupiah Banda. He is now working with President Lungu and former President Kenneth Kaunda to find a way of stopping the wheels of justice through bribes or a fresh agreement with Barotseland. The Zambian government had argued in its submission to the Commission that the people of Barotseland had not exhausted local remedies through the Zambian High Court. Four senior Barotseland independence activists are currently under going trial before the Kabwe High Court on a charge of treason for advocating Barotseland’s independence following Zambia’s abrogation of the 1964 unity treaty. Barotseland international lawyers are currently finalizing on diplomatic matters before the case is filed before the International Court of Justice in The Hague, Netherlands.